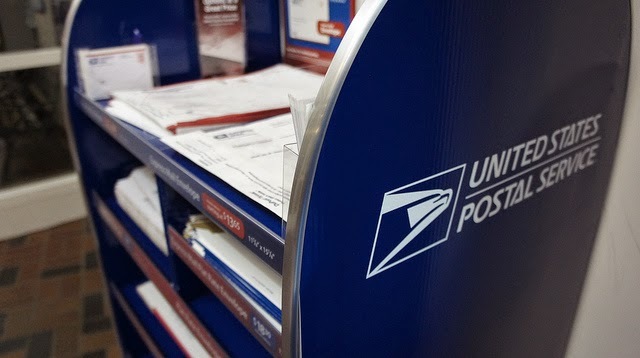 After reading this post by my French yummy mummy blogger friend, Muriel Jacques, I felt compelled to analyze what had happened to me yesterday at the Post Office. At the time, I simply brushed it off and was able to convince myself to just let it go. However, I knew deep down it bothered me and reading Muriel's post sort of gave me permission to admit to myself that it was 'something' and not just 'nothing'. I went to our local USPS office to send a small package for a friend in the East coast. I had a small envelope with a card, and a few small make-up products to ship to her. When I got to the tiny office, there was a line of maybe 5 people and I had to excuse myself for cutting through in order to get to the back wall where all my packaging options were. There were regular envelopes, padded envelopes, boxes of different sizes, flat-rate, military and express. Now, if you knew me, you'd know that even before driving to the post office, I'd have already checked out my options online. I had mentally chosen which packaging would suit me best and knew the differences between the services, except for the price. However, when I got there, I didn't see everything I saw online and also found one that seemed like a better option. It was the express padded envelope. It was clear to me that I needed the quickest delivery time possible, although I wanted to make sure I had grabbed the correct size for what I needed to ship. Naturally, I stood there staring at the shelves, going back and forth as I tried to weigh my options and decide on the most practical one, cost-wise. It was then that this authoritative voice blurted out behind me, after seeing that I had an express envelope in my hand. "The express is if you want next day delivery". I knew the voice was addressing me, so I turned around and found that the voice came from a bearded 50-something man, a fellow customer, not a USPS employee. He looked at me in a way that made me feel he perceived me like some lost little girl. I was a bit caught off guard, but knew that I had to say something back to 'defend' myself, to clarify to him that I knew what I was doing. I tried really hard not to snap and say, "I figured that much when I saw 'express', you know." Politely and with a smile (as always) I instead opted for, "Yeah, I know. I'm just figuring out the sizes for my package. Thanks!" I felt quite conflicted after that. The 'ego' part of me felt insulted, suspicious. Was he really just the type who loved offering unsolicited advice with the pure intention of helping others? Or did he feel the need to speak up because I stood out in this small town of ours as one among the very, very few non-white people, and it was easy for him to assume that I wasn't familiar with the system? I couldn't help but feel that there was something condescending about the way he said what he said. Was it so hard for him to believe that I could be fully capable of asking the USPS staff myself if I had any questions at all? Was it even harder for him to give me the benefit of the doubt that I knew exactly what I wanted, exactly what I was doing, and that I really was just in the process of choosing and shopping around for my options? I wasn't in line slowing any one down. I was minding my business. Why did he feel compelled not to mind his? We often complain that in our modern society, people are losing touch and have become extremely impersonal. We often ask where the helping hands have gone and what ever happened to acknowledging each other instead of passing each other by like fog or smoke or some specter. But at the same time, we (or is it just me?) don't like it when someone offers unsolicited help and feel quite offended or insulted. This balance is tough. Like I said, I feel conflicted although prefer to give this man the benefit of the doubt, if only to keep myself from feeling pissed off. I just really wish he had opted to wait and see if I really needed help and would ask for it myself. I guess some people just can't help themselves. Have you been in a similar situation where someone wrongly assumed that you needed assistance? How did you feel? How did you handle it? Hi Joy! My best guess is that the guy simply couldn't help himself. It was all about him, not you. It might in fact be the only conversation the poor guy gets all day. Who knows? He might have even been flirting with you. Some people aren't very good with social graces and he sounds like a few people I know. You let him know that you didn't really need or want his help (or attention) and that was good enough. Sometimes interactions with others is just that--nothing. :-) Unless something else happened you didn't mention???? Haha, no Kathy, nothing else happened, except that I grabbed what I needed, went back to my car, stuffed the envelope and went back in to line up to pay. By that time, there was no line and the man was gone. Like I said Muriel, I'd like to give him the benefit of the doubt no matter how condescending it felt. But I must admit. Going with the flow would be hard for me. I guess it depends on the situation or how it was said. However, I never enjoy it when people go out of their way to show superiority. I may have a comeback sometimes, or I may just cuss them under my breath, lol! It's such a strange line, isn't it? When people can help others but don't we wonder what's happening to the world today that no one reaches out and offers assistance to another human being any more. Yet when they do, we wonder why they don't mind their own business. I think . . . I'd like to think . . . that someone seeing another person who looks perplexed and offers help is just someone trying to offer help. Naive? It's certainly possible. Yes, it's a very delicate line indeed, Karen. And no, you're not being naive. That's also how I 'prefer' to perceive it, although like I said, I didn't enjoy the 'delivery' and hope he's like that to everyone else, instead of singling me out. But yes, it's worth letting this one go :-)) Thanks! Oooh, that is a tough balancing act to do, to offer the right kind of help in the right situation and in the right way. I agree with Kathy that his demeanor was all about him and not about you. Anyway, you've made me think about HOW we "help" and how to better attune to people. You've made a very good point, Lori. It did do the same for me, to think of how others may respond to help offered and be more sensitive and diplomatic, if I may say so. Thanks so much! Tough call. I like to give folks the benefit of the doubt. However, I might have been compelled to reply - "Oh, do you work here? Thx for the tip." I am not really sure what his intentions where but as he was only trying to be helpful I don't understand what the big deal was. I worked at the post office for many years and it is confusing to me. I don't understand what being white had to do with it but seems to me this is why people don't offer to help anymore becauze people like you seem to jump to the wrong conclusions. Just my personal thought and in no way intended to offend or help! Rena, yes, I don't know either what was going on in his mind and like I said, I'd rather give him the benefit of the doubt. I'm sure your work at the post office had both good and bad. However, this man who 'tried to give me assistance' was not a worker. From among the 5 plus people lined up / customers, he was the only one who 'chimed 'in. He was not an employee and I want to stress that. Had he been one, then I would've completely understood the 'compulsion' to help. I was just wondering if he assumed I was lost or what was it that made him think I needed help since I wasn't asking for it. Had I needed it, I think I'm fully capable of asking for it myself, from anyone for that matter. I appreciate it when people try to help others, but I think there's a tone, a way, that is more easily acceptable than some. I didn't feel that way in this situation. Thank you though for your input. My vote is condesending douche!